Did you know that on an average day in America, there are more than 200 workplace fires? That’s a staggering and frightening statistic. What’s even more frightening is that each year, these fires kill hundreds of workers, injure many thousands more, and cost businesses billions of dollars in damage and lost work time. Scrap materials and trash – As waste piles up, the potential for a devastating fire increases. Dust – If ignited, excess dust or powder in the air from wood, plastic, or metal operations could cause an explosion. 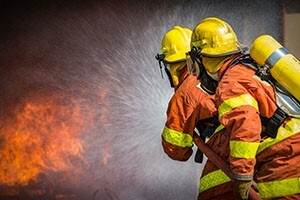 Flammable liquids – Improper handling, storage, or disposal of flammable liquids used in production processes or cleaning operations is a leading cause of workplace fires. Combustible materials – Common materials like paper, cardboard, cloth, and wood, or products made from these materials, can create fire hazards. Oily rags or other materials soaked with oil, can spontaneously combust if left lying around. Electrical problems – Overloaded circuits and outlets, damaged wiring, defective switches, and damaged plugs can all lead to electrical fires. Heat and ignition sources – Any source of heat or ignition, such as a spark, can cause a fire when combined with combustible or flammable materials. Machinery – Inadequately lubricated or dirty machinery, along with mechanical defects can also cause fires. Smoking – If a smoker tosses a match or cigarette into a wastebasket thinking it’s extinguished when it’s not, it could cause a fire. Inspect all areas of your workplace for fire hazards. Educate your co-workers about fire hazards. Make sure you have the right fire extinguishers for the fire hazards in your facility. Safely store flammable materials, keeping storage areas well ventilated and free of ignition sources. Dispose of wastes promptly and correctly, eliminating the piling-up of combustible waste materials. Emphasize good housekeeping to keep work areas clean and free of fire hazards. Make sure ventilation systems operate effectively to remove flammable vapors, gases, and combustible dust from the air. Service machines regularly, based on an adequate maintenance schedule. Pay careful attention to electrical safety, checking electrical circuits, outlets, wires, and plugs regularly. Enforce fire safety rules, including your no smoking policy. October is National Fire Safety Month. By following a few simple steps and taking the proper precautions, you can help prevent fires and keep everyone safe.